Mediation is where an impartial third party facilitates a conversational process between the disputing parties to come to a satisfactory resolution. Mediation is a voluntary and non-binding process, however, is regulated by the Code of Civil Procedure, 1908. 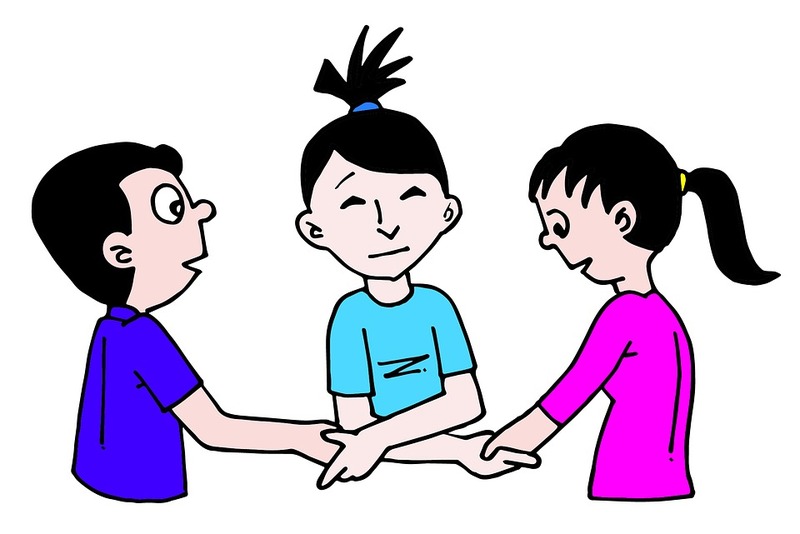 Mediation allows for parties from both sides to directly express their thoughts on the dispute at hand and to create a unique solution that will meet both parties’ needs. The mediator should not be a judge or make decisions. The role of the mediator is to facilitate the conversation through negotiation- and communication techniques. Mediation is based on following a process and certain protocols. This process allows the parties to focus on the real problems behind the dispute and requires all parties to actively participate. The aim is to devote more time to finding a voluntary, functional, durable, and peaceful solution. The mediation process allows for any of the disputants to withdraw from mediation and refer the dispute to the court system. It is advised for the resolution to be drawn up in contract form at the end of the mediation. Since mediation is not under the authority of a judge, such a contract makes the mediation process legally more binding. This is to ensure that both parties recognise their part in the process forward, and give compliance. It is also tangible proof of the mediation process, and the achievement reached between the parties. This written document creates a clear ending to the mediation process. Conciliation is focused on building a positive relationship between the disputing parties. Conciliation looks for a right that has been violated, and then try to find the best course of action. This is done through a facilitator that drives the disputants towards a satisfactory goal. This method is more fixed by law and governed by the Arbitration and Conciliation Act, 1996. Conciliation is more often used preventatively, to stop a conflict from developing into something substantial. It is characterised by the parties’ voluntary participation in the process with the intent of finding a beneficial solution for all parties involved. It has a strict confidentiality rule that is enforced by law. Conciliation allows for the facilitator to play a more direct role in the solution for the dispute. The facilitator can make suggestions towards certain proposals, and give advice for certain solutions. Therefore should the facilitator be an expert in a certain field that relates to the dispute at hand. The “impartial” role, in conciliation, is rather seen as an authoritative figure with the role of finding the most beneficial solution to the dispute. Most often it is the facilitator that proposes the terms of the agreement, and not the disputant parties. Conciliation also aims to reconcile and maintain existing business relationships between the parties. This is not necessarily done according to a certain procedure or protocol like with mediation. The facilitator will determine the route depending on the case, often administering the conciliation process as a negotiation. 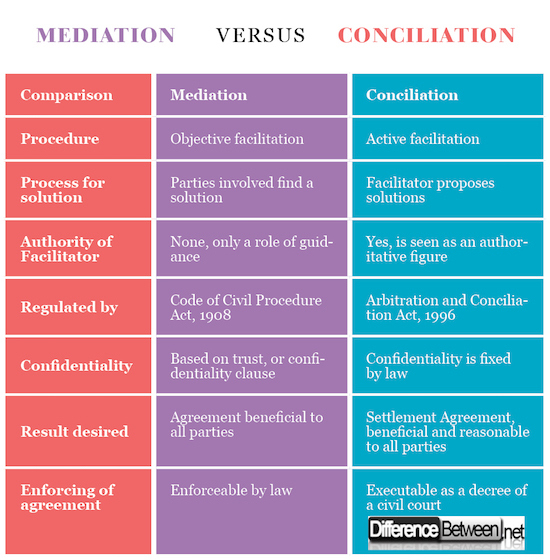 Both mediation and conciliation are Alternative Dispute Resolutions (ADR’s). ADR’s deal with disputes out of the courtroom in order to settle disputes in a private, faster, and cost-effective way. Mediation and Conciliation are closely related to such an extent that they are often used synonymously, but are different and governed by different acts. Mediation and conciliation both make use of a facilitator to help with the process of resolving a dispute and building positive relationships between the parties. The aim is to find a solution to the dispute in a peaceful manner. Both processes are non-judicial and are the disputes, therefore, solved out of court. Both follow a process where the parties do not compete against each other but work together to find a solution. They are both voluntary alternatives to adjudicate legal disputes. As can be seen above mediation and conciliation are similar in many aspects, and it is understandable that they are used synonymously. Yet they must be distinguished. So what are the main differences between the two Alternative Dispute Resolutions? In mediation, the facilitator should be impartial and objective to the parties’ dispute, while with conciliation the facilitator plays a more active role. In mediation, the parties are encouraged to find a solution, with the facilitator only acting as a guide. While with conciliation the facilitator has the responsibility to identify the objectives of the parties and actively help find a solution. Within mediation, the facilitator does not give any judgement. With conciliation, the facilitator also plays the role of evaluator and intervener that base the solution on what is deemed the most beneficial solution according to the facilitator. It is not necessary to find a resolution when it comes to mediation, but the aim is an agreement. With conciliation, a resolution is a necessary outcome and is executable as a decree of the civil court. 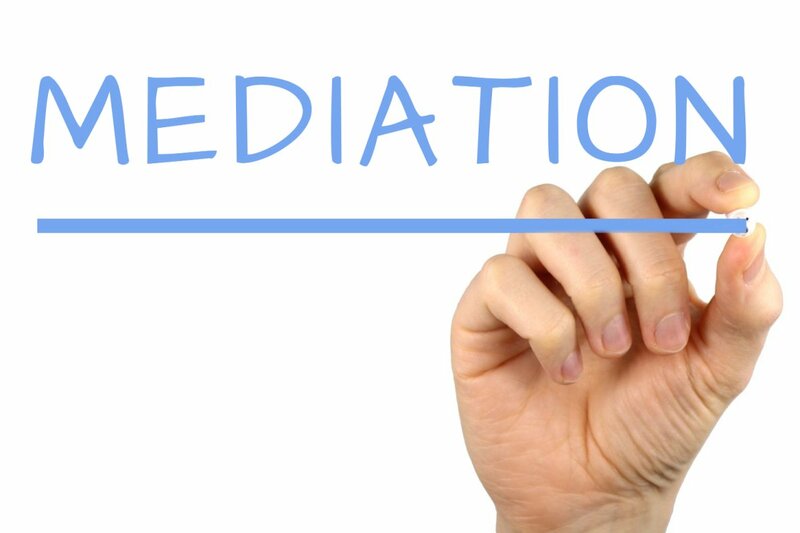 Mediation is governed by the Code of Civil Procedure Act, 1908. Conciliation is governed by the Arbitration and Conciliation Act, 1996. Confidentiality plays an important part in both processes, however, they are enforced differently. Within mediation confidentiality is based on trust, and is it advised for all parties to sign a Confidentiality Clause for extra measure. Confidentiality in conciliation is determined by the law. Mediation intervenes when a substantial conflict or dispute have arisen that needs professional intervention. Conciliation is used preventively and aims to stop a dispute to developing into something substantial. It can be completely understood why the two processes are often seen as the same. However the main difference in practice lies in the method of facilitation, and the active or impartial role played by the facilitator. The two methods should however not be confused, as they do indeed serve different purposes, and as can be seen, a failed conciliation can lead to a mediation. A successful conciliation can avoid mediation or any other dispute resolutions altogether. As ADR’s these methods save time, money, and have the added benefit of finding creative solutions that promote the development of healthy business relationships in the future. The aim must always be to find a solution to the dispute. However, the context of the dispute will determine which method will be more suitable. david. "The Difference Between Mediation and Conciliation." DifferenceBetween.net. April 12, 2018 < http://www.differencebetween.net/miscellaneous/legal-miscellaneous/the-difference-between-mediation-and-conciliation/ >. "Compare and contrast the following forms of dispute avoidance." LawTeacher.net. 11 2013. All Answers Ltd. 04 2018 . Moore, Christopher W. The Mediation Process: Practical Strategies for Resolving Conflict. San Francisco: Jossey-Bass, 2014. Sgubini, Alessandra, Mara Prieditis and Andrea Marigh. “Arbitration, Mediation and Conciliation: differences and similarities from an International and Italian business perspective.” Bridge Mediation (2004).